The residents of Durga Nagar in Khanapur town about 25 km from Belagavi were panic stricken as a leopard was sighted on Wednesday morning. Forest department rushed to the spot to search the big cat. a couple of farmers spotted the leopard in their field behind police training school in Durga Nagar at about 9 am. As soon as they did, they intimated the instructors of the police training school as well as the residents around, who then informed the forest department. 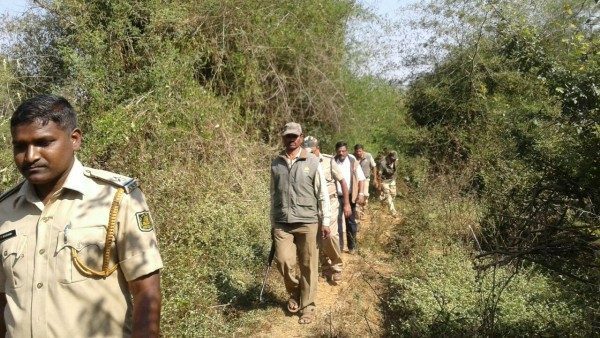 Deputy Conservator of Forests B V Patil and Assistant Conservator of Forests C B Patil, Range Forest Officer (RFO) S S Ningani and team commenced the search operation covering a radius of about 15 kilometers from that area. Fresh pug mark of big cat were spotted on the bank of a stream, about a kilometer away from the spot where it was spotted by the two farmers. Forest sources said it could be a young leopard of about two-and-a-half-year-old. Sources later confirmed that the leopard had ventured back into the forest. Forest officials have installed installed camera traps covering the identified spots there. A leopard strayed to a cultivation field close to the jungle due to non-availability of its food. Forest department should send some dogs or rabbits inside the jungle, where leopards are likely to reside, to avoid their visit to a nearby human colony.